You all know I’m modest, right? At the risk of overstating this, I’m probably the most modest person in the world. I hate to brag or even humblebrag or even slip in the odd backdoor brag, even when I’m most deserving. I know it’s infuriating to most of you, because you’re like, “if you won’t sing your own praises than who are we to sing ours?” And I’m like, “touché, you should probs shut your goddamn face.” Ah, I kid. We have fun, don’t we? Anyways, I discovered Beyoncé. Wow, that took a lot of courage to admit. I’ve been holding that in for like 17 years, y’all. ‘Twasn’t easy living in obscurity as Queen Bey took the world by storm for the better part of two decades. It has taken every ounce of my good natured generosity to stay in that passenger seat as she’s been careening down the glittering super highway of fame at a rapid yet calculated speed. I very nearly broke on multiple occasions. Picture it: 1999, Bug a Boo hits the airwaves. Teenagers everywhere rejoice, thrilled to have a much-needed reprieve from the Britney/Christina contrived battle of the day in favor of a hip hop beat and sassy lyrics. Bey steps out in a red cowboy hat and subsequently takes the nation by storm. 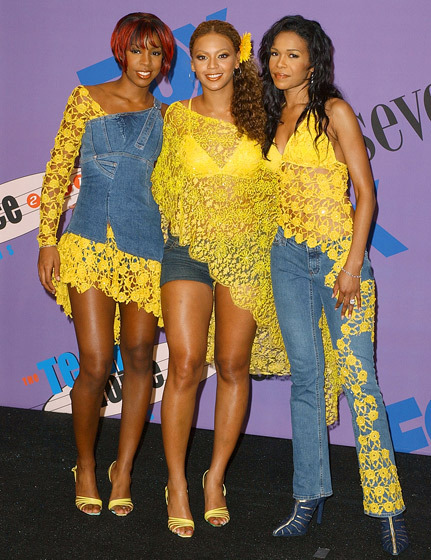 Destiny’s Child is all the rage. The group is chosen to be the opening act for the Christina Aguilera concert at the Ice Palace in Tampa Bay. Young Deena enters in a carefully selected sequined tube top with the discreet shiny plastic “invisible” straps oft-seen on her dance team uniforms. She watches the concert enthralled by the talent of one front woman. Always the equal opportunity supporter, she is hesitant to detract from Latoya or Latavia or any of the other early members of the group by stating what she deems the obvious. “They should call it ‘Beyoncé‘s Child,'” quipped a young Deena, accurately deeming Beyonce the one with all the talent and the others deemed to a life of backup entertaining. I predicted the future, y’all. She may have been hiding behind Tina Knowles designs and strong-armed by a controlling Matthew, but I saw past all of that. I saw her for the star she truly was and would continue to be to this day. The Von Trapps I presume? It would be four whole years before Beyoncé stepped out on her own as a solo artist, and I watched admirably from a safe distance. It seems young Bey acknowledged my foresight and tipped her red cowboy hat in my direction with the release of Crazy in Love. She knew I didn’t need the validation of a public acknowledgement. We both knew who saw her star power burning beneath outfits reminiscent of the Von Trapp children. So there you have it. What I’ve sacrificed in my silence I hope I’ve more than made up for with my gift to the world. You’re welcome for your Queen.